Photo & affiche par Mario Jean. 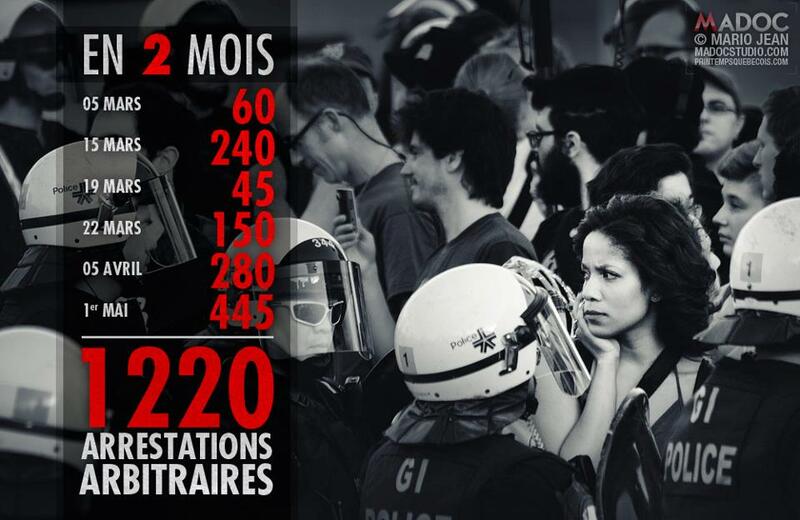 Between March 5 and May 1, 2013, 1223 people have been arrested, detained and ticketed by Montréal police (SPVM) for participating in demonstrations. 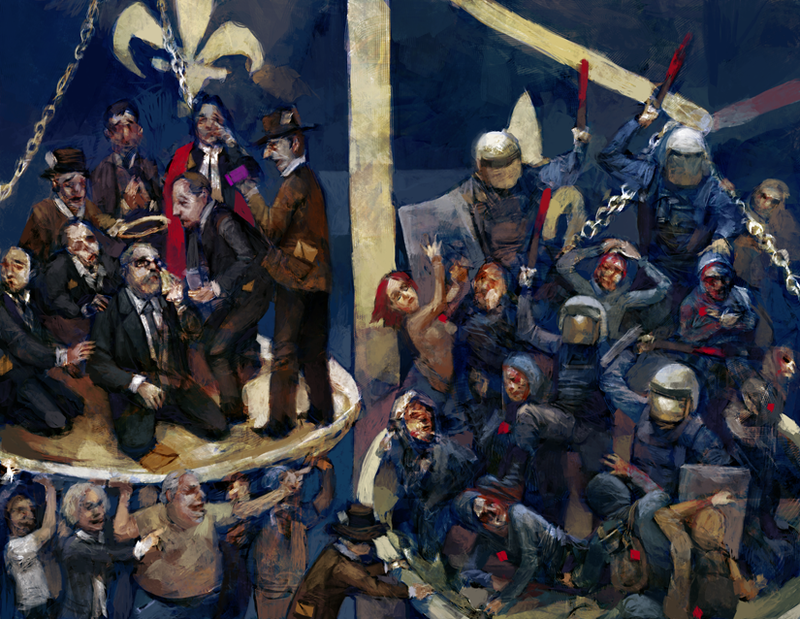 In 2005 and 2012, the UN Human Rights Commission criticized Montréal police for their regular practice of mass arrests that contravenes the Canadian Charter of Rights and Freedoms which “guarantees” the right to freedom of expression and freedom of peaceful assembly. The criticism seems to have had little effect because the legislative use of police for political repression is a problem that is getting worse in the city plagued by corruption. “Balance” October 27, 2012 – by Artact QC. The annual May 1st demonstration had a starting point in front of Montréal’s City Hall and a destination 1.4 kms west of their at Club 357C. The organizers wanted to make a link between municipal & provincial political party financing and organized corruption in the construction business. Secret meetings, brown envelopes, 3% payouts, syphoned public funds, land deals and other corporate/political collusion have been negotiated at the exclusive private businessman’s club whose notoriety began at the Charbonneau Commission. Montréal, Laval and Mascouche city mayors were forced to resign as a result of corruption allegations unearthed at the Commission. Provincial Ministers have not been immune to the scandals. The violent kettling of Montréal’s May 1st demonstration, and the subsequent treatment of the 447 people detained on STM buses for hours with hands tie-wrapped behind their backs, confirms that the municipal government (with the silent approval of Québec City) is using the SPVM to quash public dissent before the 2013 Formula 1 Grand Prix de Montréal. In the past two months, police tactics at six demonstrations began with violent entrapment, followed by hours of illegal confinement, then ending with extortion. 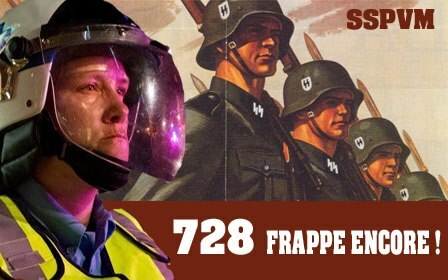 Officer 728, well known for her abuse of power and politicalprofiling against demonstrators, is not an isolated case, as many were reminded on May 1. 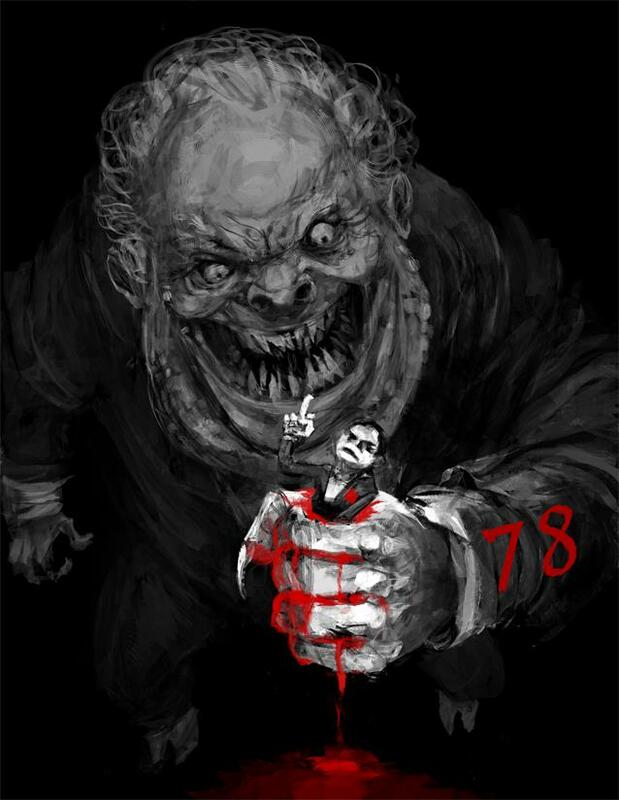 “728 strikes again!” Artist unknown. At the March 5th 2013 demonstration against tuition fee indexing (also known as the Ostie de grosse manif de soir contre la hausse éternelle), riot police arrested 62 people, who were each given a ticket under section 2 of bylaw P-6 for $637. Bylaw P-6 allows the police to declare illegal any public gathering if people’s faces are masked or if a demonstration proceeds without following an itinerary approved by the police. On March 15th during the annual demonstration organized by the Collective Against Police Brutality (COBP), a bigger mass arrest was made within minutes of the demonstration’s departure. 239 people were detained and given tickets for 637$ under bylaw P-6. Four days later, at another demonstration against tuition fee indexation, 45 people were kettled and ticketed under bylaw P-6 with fines of $637. “The right to demonstrate in peril! 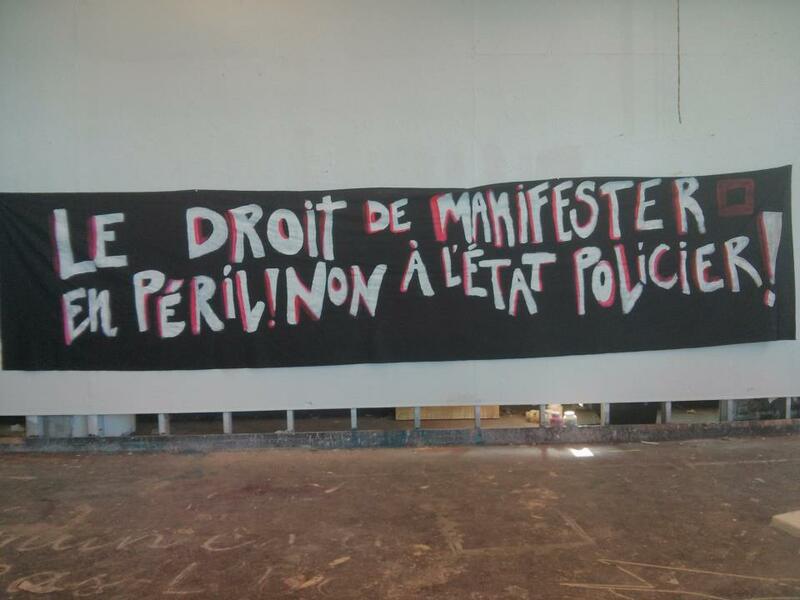 No to the police state!” Banner made for the March 22nd demonstration by the Association facultaire étudiante de science politique et droit (AFESPED-UQAM). On March 22nd 2013, the anniversary of the first massive ‘national’ demonstration of the 2012 student strike. The police began dispersing the protestors in Parc Émilie-Gamelin even before it got started. As demonstrators left the park, police lines forced them eastward against traffic along boul. de Maisonneuve: a violation of bylaw P-6. Mass arrests ensued and 150 people were given $637 tickets. A demonstration was held on April 5, 2013 to denounce the abusive use of P-6 and the SPVM’s systematic repression of demonstrations. Within minutes and without a warning nor request for dispersal, riot police surrounded the demonstration in a ritual onslaught of physical and verbal abuse that is a reminder that Constable 728 is not an isolated case. Intolerance, brutality and impunity casts a wide net over the SPVM, which continues its unconstitutional intimidation with bylaw P-6. A total of 280 people were surrounded that day and given $637 tickets. Anarchopanda, the student movement’s anarcho-pacifist mascot — the most vocal opponent to bylaw P-6 — had his plush head confiscated by police. 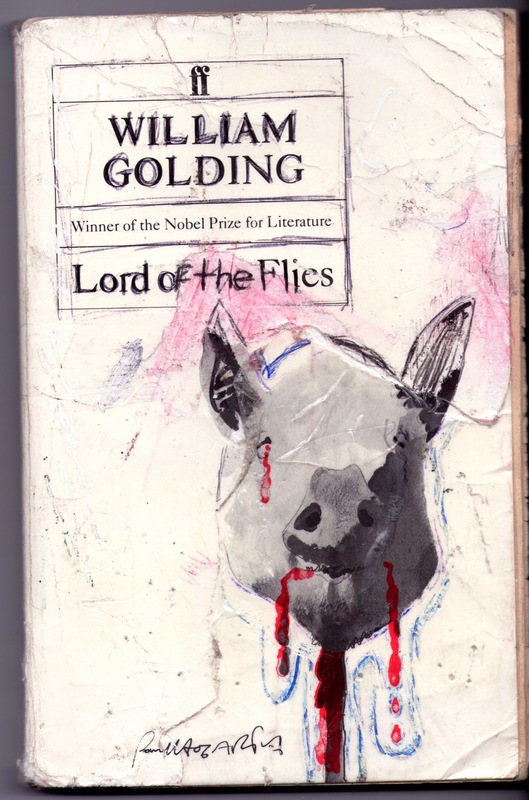 Lord of The Flies come to mind. “We need to give Anarchopanda’s head back! Yeah, yeah… In a minute!” editorial cartoon by André-Philippe Côté, 10 april 2013. Then finally May 1st. This time 447 people were hand-cuffed with plastic tie-wraps, loaded onto at least seventeen STM buses and driven to the SPVM’s Eastern Operations Centre in St-Leonard to receive their $637 tickets. The crowd was surrounded at about 7:00pm. The last ones to leave the police station, ticket in hand, did so past 2:00am. Extortion is described in the New Oxford American Dictionary as “the practice of obtaining something, especially money, through force or threats.” The SPVM, with the support of a majority of municipal councillors, continue to use violence and the anti-protest bylaw P-6 to quash protest in Montréal. Stay off the streets or we will crush you physically and financially. So far the SPVM has practiced extortion valuing a total of $788,611 between March 5 and May 1, 2013. Three quarters of a million dollars of tragetted fines in less than two months! Political corruption is thriving in Québec. Police impunity is running amuck in Montréal. Charter rights and freedoms are suffering. Protests will continue. And Most of the tickets given out at the descretion of the SPVM under bylaw P-6 or are being contested and the tickets given using article 500.1 of the Highway Security Code are now being challenged in the courts for their non-constitutionality. 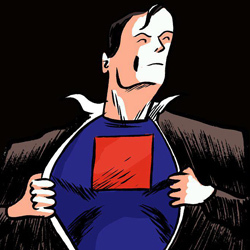 Why Montrealers must resist bylaw P-6 by Fred Burrill in Maisonneuve, May 10, 2013. Thanks Simon for the reference. I will read your article with interest !